These mitts make use of the same picot hem and spiral eyelet pattern as Knitty Gritty Thoughts’ spiral cowl, but at a smaller gauge. 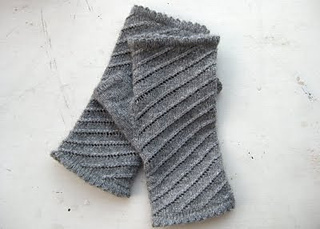 The yarn is exactly half the weight of the yarn used in the spiral cowl pattern, so one could easily knit these mitts with the yarn held single and the cowl with the yarn held double. 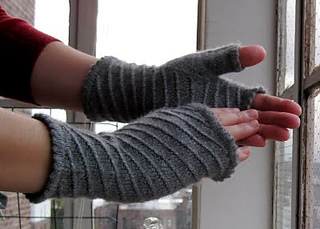 Note: these are top-down mitts -- they’re knit from the fingers down, so you can adjust the length of the cuff for the amount of yarn you have to work with.